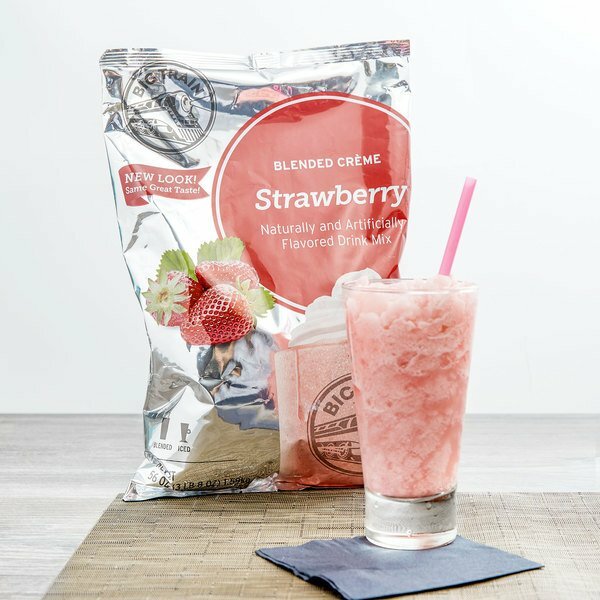 For a refreshing, fruity drink your customers won't be able to resist, try this Big Train strawberry blended creme frappe mix! With a name symbolizing strength and constant motion, Big Train has expanded into a global foodservice brand you can trust with a large number of diverse products to choose from. Big Train has become a leader in the specialty beverage mix industry, delivering easy-to-make and consistently-delicious products. Treat your guests to the summery, fresh taste of sun-ripened strawberries with this fruity drink mix! Create berry blended drinks with sweet strawberry flavor, or add pieces of strawberry fruit or candy to create unique dessert drinks. Make a creamy, classic strawberry milkshake without needing to supply the ice cream! Coffee and caffeine free, this blended frappe mix is the perfect alternative for customers who do not prefer coffee. Use this mix as a base for frozen dessert drinks, and delight all of your guests! They can rest assured that this mix is gluten free, trans fat free, and contains no hydrogenated oil. This mix is perfect for sprucing up the menu in your coffee shop or cafe in order to offer profitable, creamy, decadent drinks. Better yet, these drinks are easier than ever to make! Just add water for refreshing, gourmet strawberry taste. This blended creme frappe mix adds alluring flavor to your signature iced or blended drinks, while satisfying your patrons' cravings for something sweet and new! For an 8 oz. hot drink, combine 1 scoop of Big Train Mix with 7 oz. of hot water, coffee, milk, or dairy substitute. Stir and serve. This strawberry Frappe is so ridiculously good! It is like a frappe version of strawberry nesquick. Once you try it you will be so hooked! This is a great mix for both Frappes and smoothies. It can be used with many flavors of syrup and other dry mixes for many awesome combinations. This frappe mix has a very good strawberry scent and flavor. The vibrant pink waters your palette with anticipation of enjoying this beverage. Great product! The Big Train Strawberry & Cream frappe mix is very thing and almost tastes like real strawberries. It is one of the favorites in our coffee shop. 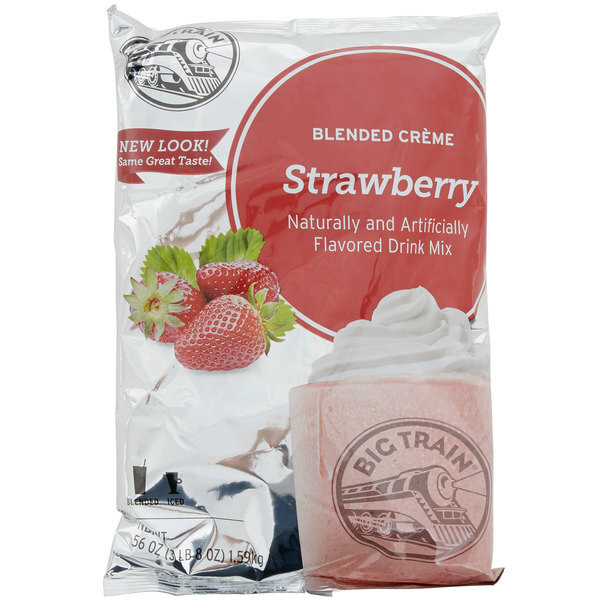 The Big Train Strawberry Blended Creme Frappe Mix tastes really good and is easy to use for making frappes and other specialty beverages. We will buy again. I am not a strawberry fan but the customers seem to really like the strawberry blend. Big Train products are of good quality and flavor. The Big Train strawberry blended crème frappe mix tastes so sweet and fresh. A great spring time treat at our ice cream parlor. The strawberry flavor is rich and prominent and blends well. The Big Train Strawberry Frappe mix is a breeze to prepare in a fast paced cafe setting. Customers love the flavor and the cost per serving is very good. Tastes amazing and tastes just like the real thing. We use it to make frappes and bubble teas. Highly recommend for drink mix and other cold drinks. My Family cannot get enough of Big Trains Frappe Mixes. We are now disappointed when we order one somewhere else. They don't compare to Big Train. This strawberry is really good! Mix this Strawberry Frappe with two cup of ice and half cup of milk you will get a really nice flavor, our costumer love it! True to taste and the most authentic mix that we have tasted. Big Train is a high quality product and even better company that makes a wide variety of delicious and natural product mixes. The strawberry blend is no different and is very easy to use to make dessert drinks. I love the flavor of this powder mix, I use it for my smoothies and add some Boba to it and they are delicious!!!! I recommend it. Bought this and the Belgian Chocolate to serve for a children's party and boy oh boy this was definitely a big hit for all ages! Really easy to use. I was looking to make my own mix of ingredients to make a frozen mix drink, but then I found this, and is great. Taste a little better with fresh fruit though.